Keep your store looking sharp and professional by standardizing your image dimension, style, and product positioning. A consistent look makes your ecommerce operation look trustworthy and boosts customer loyalty, which in turn maximizes consumer engagement and lifetime value. A photography template also helps you save a lot of time. When you have the process down to every detail, you don’t have to think about each step. Having your template documented (as opposed to just in your head) helps you delegate to other team members as you grow your operation, leaving you to more important matters. It is vital to add structure to every process related to your online store in order to scale successfully and minimize errors. Go a step further beyond creating a template and teach your team basic photography techniques, including lighting, background, and the importance of a tripod. 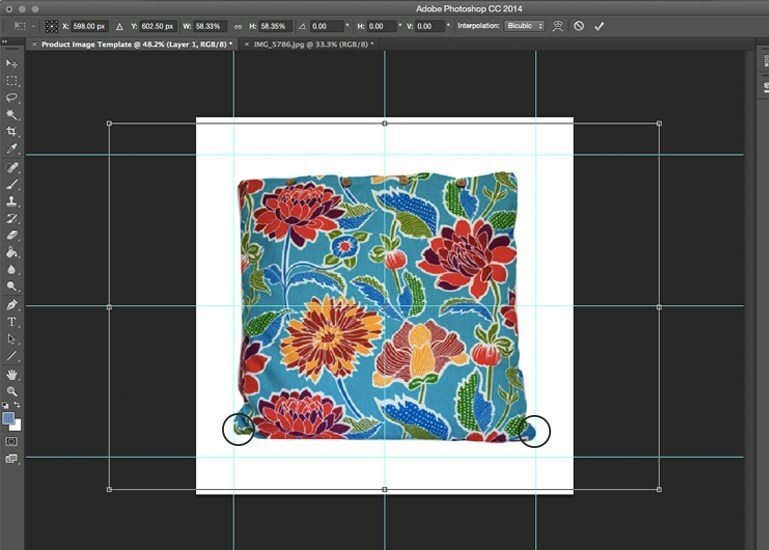 Share editing tips and online tools to remove backgrounds or bulk resize your product photos. Record every aspect of your process including angles, distances, and lights. This streamlined approach along with an optimized image template will help you automate your photo production and save you a lot of time while getting great images. A style guide with templates and detailed instruction for every aspect of both a photo shoot and post processing is a key layer in your branding. 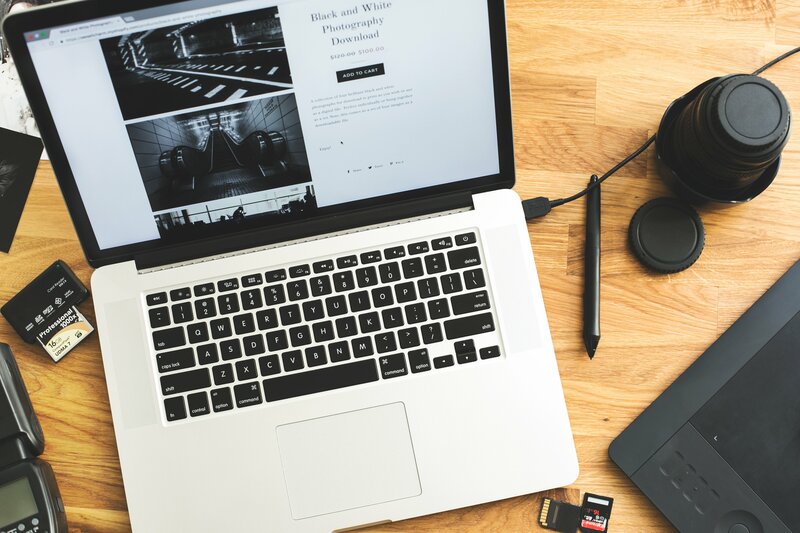 Images are vital visual elements of your branding strategy because they stand out and take up a lot of the space on your site and social media. That is why top brands are exceedingly conscious about their photos color uniformity and composition, creating an instantly recognizable brand images. Think Coca-Cola and the color red. Your color palette is one of the most recognizable aspects of your brand identity. And when you extend it to your photos, often viewers will recognize your brand even if your product is not in the image. Your palette should consist of complementing colors and similar hues. For example, if you use a light, pastel color palette you should aim to reflect that consistently in your images, not jump around to using heavy, muted tones instead. 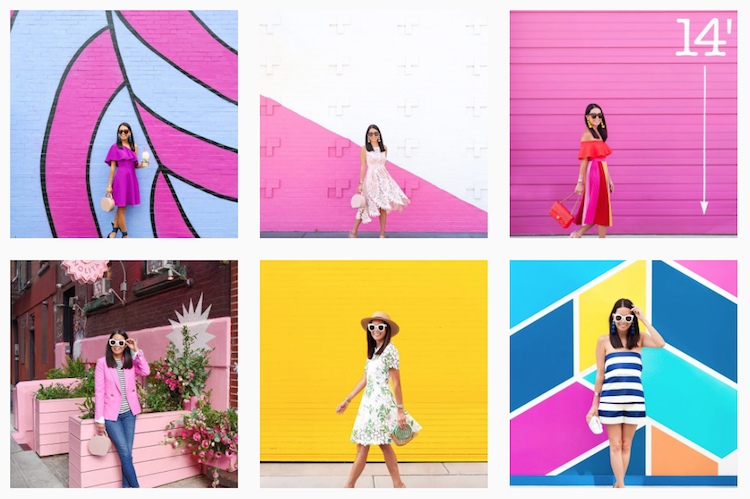 Your color saturation can dictate the emotions your brand wants to evoke. More saturated “screaming” colors can evoke passion and are more suited for a younger audience, while a more muted color palette is more thoughtful for mature audiences. This is a more technical component, but it is still important because it affects composition and how much of your image is in focus. Your focal length determines whether you have your images clear with everything in focus or some things out of focus, such as a blurry background. Shadows are another stylistic choice that you should keep uniform depending on the purpose of the images. Product page photos are usually clean-cut with no shadows while social media images can be more realistic and offer more character if you include shadows. The composition is a major element defined by your brand identity. Your brand can offer a product-focused, minimalistic look with a lot of negative space. Or you can choose a more crowded approach where your images feature multiple products and speak in more lively voice. Your product positioning within the image is also at play here. You want your customers to associate your product with a certain lifestyle or emotion, and you can create that link with your in-context images. Your overall photography strategy is usually a combination of styles, including clean-cut feature images, close-ups, and lifestyle shots. How much you use of each also defines your brand. The content of your images should be in line with your overall content and marketing strategy and offer resonating photos of models from the right age groups and subcultures you are targeting. It is vital to use the same filters, shadows, and retouching techniques in post-processing for a consistent style. Consistent retouching to vintage, glossy, or analog look adds yet another layer to your branding. Not only does your photography style guide involve similar angles, composition and content, but should also be incorporate more technical post-production work. Introducing photo editing consistency can be tricky, which is why a template is important. 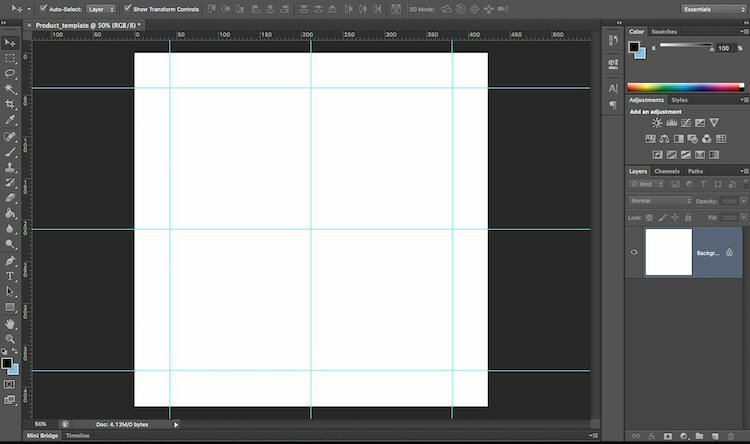 Let’s see how to create a product image template in Photoshop. Go into Photoshop and create a file with the desired aspect ratio. Adjust the finer details, including color mode to RGB 8-bit, set the resolution to at at least 72 pixels/inch, and set the background to white or transparent. From the top menu, click on View and then select New Guide. 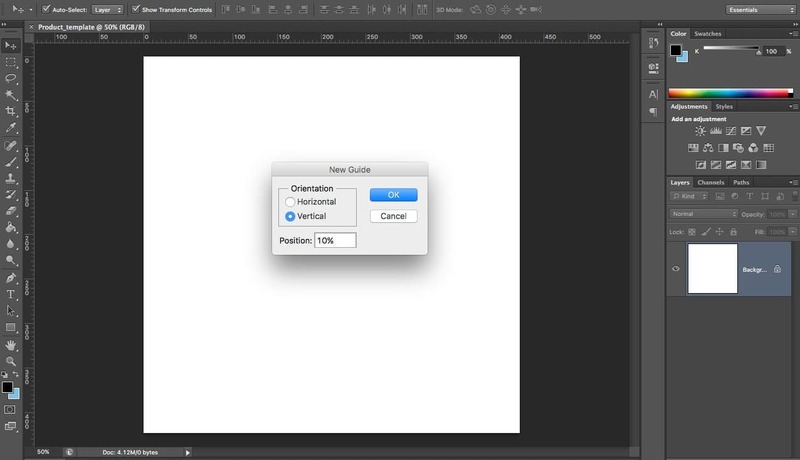 Create three types of vertical and horizontal guides, with positions at 10%, 90%, and 50%. This will give you a grid of three vertical and horizontal lines dividing your working area. 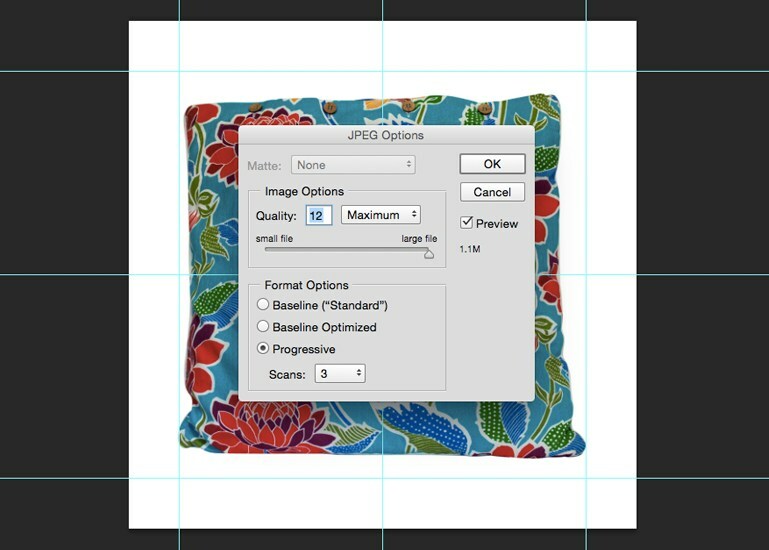 Depending on your product size and shape, you can adjust the grid to meet your needs. Now, place your edited image over the template and use the guides to properly center your product both vertically and horizontally. The template will give you consistent scale so your products images have an uniform look. 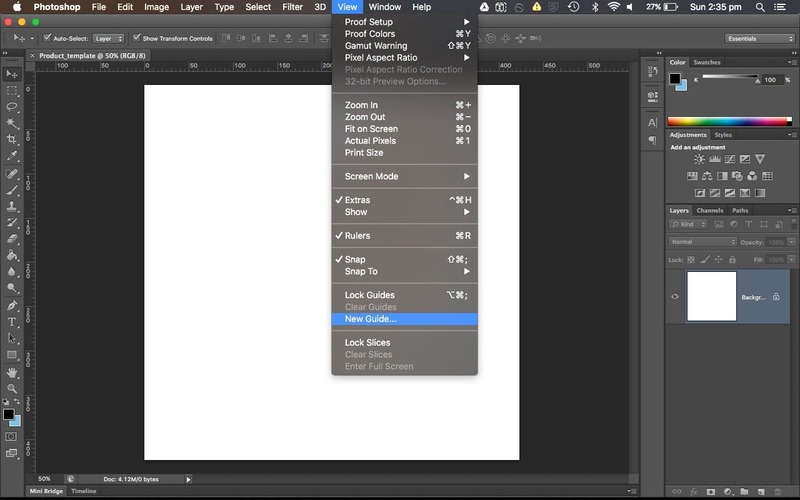 Save your template file as a Photoshop document (.PSD) and run all your edited images through the guides to ensure consistent positioning before you upload them to your store. To harness the power of good photos you have to understand how they are made. Do a few product shoots yourself, even with your smartphone, to start understanding lights, backgrounds, and retouching. Come up with creative ways of how to use in-context photos and test their effectiveness on social media. Learn which equipment - cameras, tripods, and lightboxes – has easy tricks that make you look like a pro. Get your hands dirty, and create your in-house studio. Compare natural lighting with artificial lighting setups. Find out what retouching options you have, how to quickly edit images in bulk and how to have a uniform look across your store. Take as many photos as possible, save them and revisit them to compare your progress. Save your images with SEO-optimized names to give your site a nudge in the right direction. 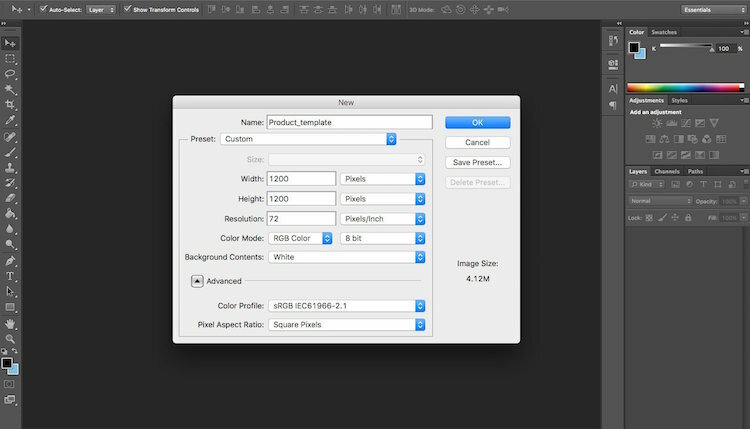 Once you have the process down, create a template to keep your images consistent and save time. That way you can delegate this task to anyone from your team as you grow and your inventory increases and diversifies. Always think ahead of the curve about how to improve your process so you stand out from the competition. 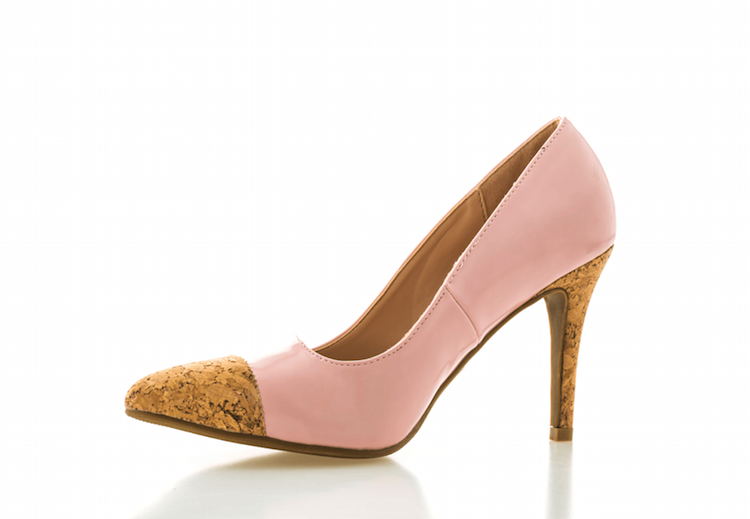 Get into product groups - shoes, jewelry, furniture - and learn the specifics of photographing them. This may include appropriate backgrounds, mannequins, and setups that bring the best out of every kind of product.